Edward Rogers (lead vocals, percussion), Amanda Thorpe (lead vocals, guitar) and Mac Randall (guitar) return with Rendezvous - their second wonderful jangled folk pop endeavour full of the "Heartaches and harmonies" that MOJO Magazine rated 3 Stars! "...avant folk-rock featuring the tangled, hushed vocals of both performers (Amanda Thorpe & Edward Rogers). Haunting tracks..."
"Bedsit Poets...deliver tender originals that have an early-sixties innocence." "The Bedsit Poets' 2006 debut The Summer That Changed was a gorgeously summery collection of soaring, harmony-driven, Britfolk-flavored anthems and mellower pop numbers. By contrast, this is their autumn album, pensive, jazzier and more stylistically diverse. The charming harmonies of Amanda Thorpe and Edward Rogers (both of whom have released excellent solo cds this year) are still there, as are the virtuosic, thoughtful guitar of Mac Randall, and Nancy Polstein's tasteful drums and percussion work. But this time the band looks outside Rogers' and Thorpe's native England for influences ranging from 60s French ye-ye pop to Norah Jones." In totality, Rendezvous offers reflections on love, life and growing up, from childhood memories of Winson Green prison in Birmingham, England, looming over the family-run off-license (British for liquor store) across the road, to ruminations on the changing landscape of Coney Island in "Hardened Ground." L'amour is a common theme that appears and reappears in many shapes and sizes: illicit daytime meetings, young love full of excitement and anticipation, hopes of reconciliation after an argument, the loss of a life partner. Ultimately, the most important thing about this recording is that it gave bandmates the wonderful opportunity to become better friends. 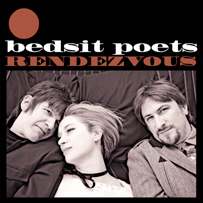 The Bedsit Poets story began when Edward Rogers and Amanda Thorpe, two UK musicians living in New York, decided to parlay their friendship and similar musical tastes into something outside of their respective solo careers. Meanwhile, Mac Randall, a well respected rock writer/editor and music author, found his mutual friendship with Edward and Amanda transformed into the foundation of something truly different. This eclectic mix of folk pop harmonies and 60s sensibilities, pinned by the ying and yang of New York and London experiences, quickly found a home at Bongo Beat Records which wasted little time in releasing their magical debut (The Summer That Changed) far and wide across the globe; earning rave reviews in the UK, Australia, Spain, Canada and elsewhere. The group followed quickly thereafter with a world tour that saw them in the UK, Spain and a key slot at the NXNE Festival; not forgetting a triumphant homecoming at the prestigious Joe's Pub, New York City. Rendezvous ups the stakes considerably with a more personal lyrical viewpoint. The album includes a brilliant cover of Big Star's "I'm In Love With A Girl" that is sure to surprise. The sincerity will disarm you. The music will enrapture you.